Not very many Mercedes fire trucks working in France in the 1970s and 80s, although there were a few Unimogs and L1313A 4X4 brush trucks. 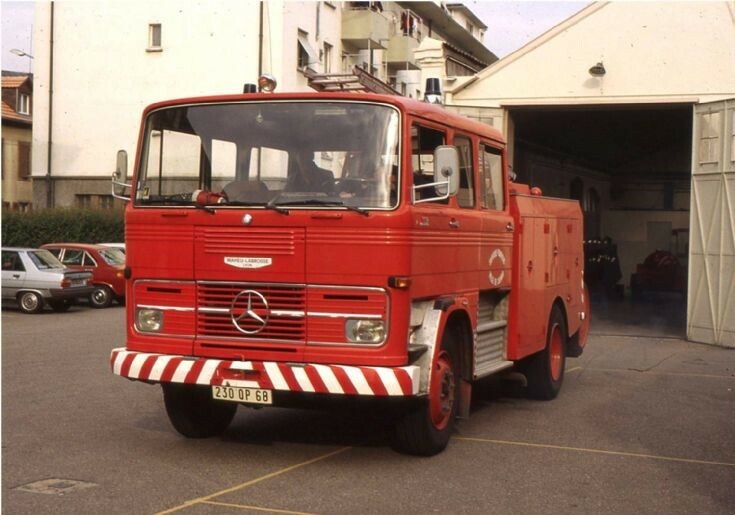 This type of forward control 1113 was almost as rare in fire service fleets in Germany too, because when it was in production almost all of their Mercedes were normal control designs. Magirus tended to dominate the forward control market, but even Magirus were still selling loads of their famous Eckhaubers. This Benz is a FPT, or pump water tender. Room for six, a water tank around 2, 500 to 3, 000 liters and a 2, 000 LPM pump. It has the traditional 200 meter one man hose carts and an extension ladder, but - quite surprisingly - no sign of any hook ladders! Added by Rob Johnson on 09 December 2017.